The Amish Berlin Corner TV Stand makes the perfect fit in a corner space. Features raised panel doors that open to extra storage that's just right for movies, music and more. Tuck yourself away in a cozy corner to watch TV with this Amish made furniture beautifying the space. 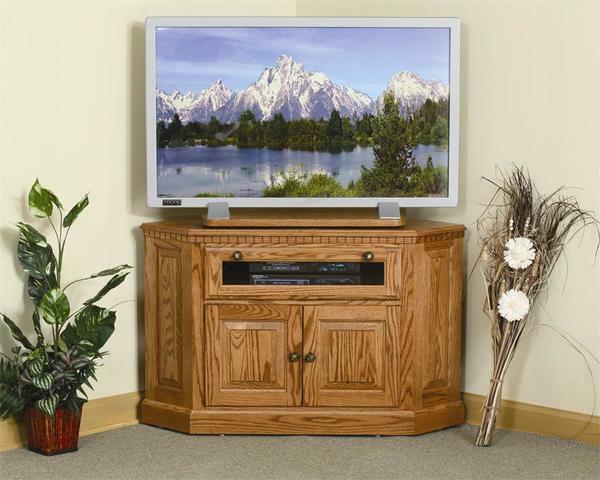 Cut just right to fit snugly, our solid wood corner TV stands help make the most of your living room space. The Berlin is available in two sizes and is custom made in the wood and finish you choose. Email or call today with any questions and one of our Furniture Specialists will be glad to help. Thank you for shopping DutchCrafters for your new living room furniture.